Back in August we had no idea how long we were going to be in London for. I had two things I wanted us to be home for, one of them was School Photo day because I wanted a photo of the 3 kids together. 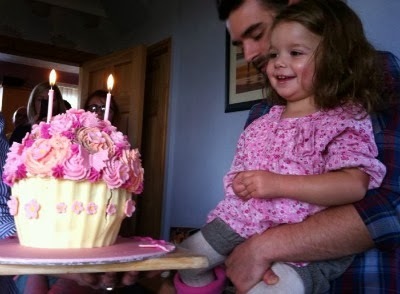 The other was to be home by 20th October for Isabella's 2nd Birthday - it would have broken my heart if we weren't all together as a family for her special day. Luckily - we made both these occasions; I got a School Photo of the 3 kids and yesterday was Isabella's birthday. dining chairs. Everyone kept warning me that I was mad to take on such a party - but it was the first chance we've had since Martha arrived to get everyone together. Mark and my Dad spend Saturday afternoon building the Birthday present while I spent the day baking cakes with my best friend Elin. 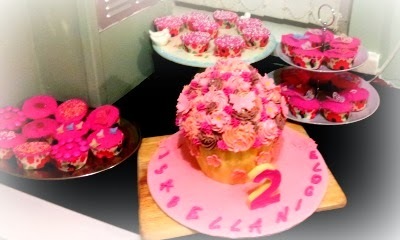 We made a Giant Cupcake as her Birthday cake and a few smaller cupcakes for party food. 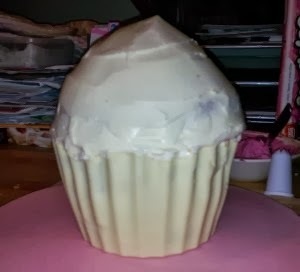 To save some time Elin had already made the white chocolate mould cupcake case the day before. 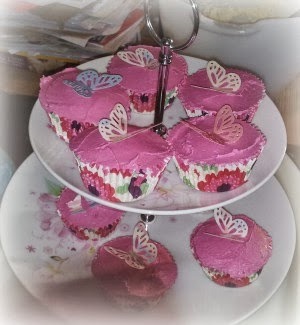 But Saturday we didn't get off to the best starts - my Kenwood stand mixer wouldn't turn on, this left me particularly upset as it is my Nains; it was a Wedding present they were given from her work colleagues on their Wedding day 50 years ago this coming March. But a quick phone call to Mother Dearest and we were in possesion of her hand mixer and could get cracking. Almost 5 hours later - we were done, cleaned up and everything. When Isabella went to bed that night Osh helped me make the Rice Krispy cakes as we all know that no party is complete without he obligatory Rice Krispy Cake. He turned to me and said "I love making cakes with you Mammi" which just made my day. I had hoped Sunday would be sunny or dry at the very least, obviously it wasn't meant to be. We woke up on Sunday morning to wind and rain. 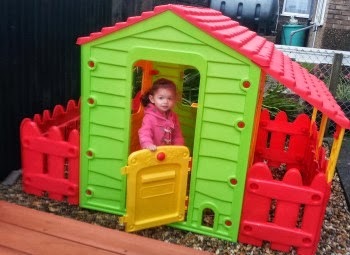 This didn't stop Isabella, we'd bought her Welly boots from Joules and she was outside in her PJ's before she'd even had her breakfast playing with her Birthday Present - her Play House. It was a battle of wills to get her back in the house for breakfast, quick change of clothes and she was back outside in the rain. Then of course it was time for Mammi to start cooking all the party food ready. 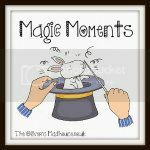 I'd asked everyone to arrive at 1pm, and at twenty past twelve I was starting to stress - the food was nowhere near ready. I'm going to ask for a range cooker next, two oven shelves is not enough to host parties for our family. I'm so lucky to have such an amazing family, everyone helped out by bringing bits of food with them, bringing fold out chairs, being on Tea making duty - hosting a party is not as relaxing as they make out in the films; I don't think I finished one Panad all day long. Isabella was loving all the attention, playing with her cousins and posing for photos. When it was time for Birthday cake she was an absolute star - it was totally worth all the work we put in to the cake to see her face light up when we brought it two her with the candles lit. She was spoilt rotten with toys and clothes. I've had to order her a new chest of drawers today because I can't fit another thing in her wardrobe. The floor in our Kitchen was a disgrace, I've mopped it twice and I'm still not satisfied it's clean. 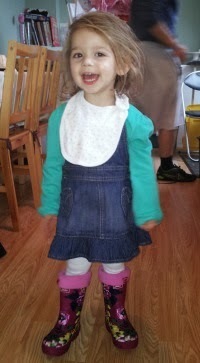 But after all my moaning about the cooking and the mess - I had a great time and I know Isabella did too. I wouldn't have done anything different; everyone we wanted here turned up, they were happy to sit on camping chairs and we're prepared to lose their chair if they got up to get food from the buffet table - no one complained about the dodgy mugs their tea was served in, no one seemed bothered they were eating off plastic plates and drinking cold drinks out of plastic cups. This time we could only hope for a day like yesterday - it seems our prayers were answered.